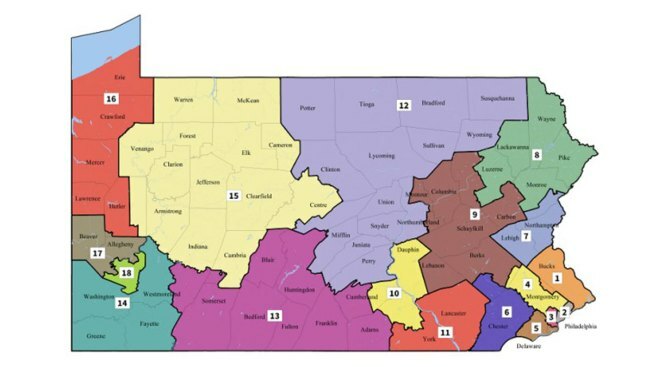 Republicans are fighting back against Pennsylvania's new congressional map. NBC10's Lauren Mayk has the details on what happens next and why tensions are running so high. Less than 24 hours after Pennsylvania’s high court issued a new congressional map, state Republicans countered with a statement of their own. Party leaders will sue in federal court as early as Wednesday to prevent the new map from taking effect. “The suit will highlight the state supreme court’s rushed decision that created chaos, confusion and unnecessary expense in the 2018 election cycle,” National Republican Congressional Committee Communications Director Matt Gorman said in a statement. The partisan move was expected by those monitoring the political horse-trading that has come to define Pennsylvania’s districts. President Donald Trump also wasted no time weighing in on the new map, calling on Pennsylvania Republicans to "challenge the new 'pushed' Congressional map, all the way to the Supreme Court, if necessary. Your Original was correct!" Hope Republicans in the Great State of Pennsylvania challenge the new “pushed” Congressional Map, all the way to the Supreme Court, if necessary. Your Original was correct! Don’t let the Dems take elections away from you so that they can raise taxes & waste money! Mark Harris, a Pittsburgh-based GOP campaign consultant, was one of many Republicans bashing the new map. "It's a straight Democratic gerrymander by a Democratic Supreme Court to help Democrats," Harris said. Independent analysts said the map should improve Democratic prospects while still favoring Republicans as a whole. An analysis conducted through PlanScore.org concluded the court's redrawn map eliminates "much of the partisan skew" favoring Republicans on the old Republican-drawn map, although not all of it. How Did Athletes From Pennsylvania, New Jersey Fare?